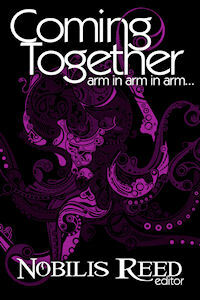 Submissions for Arm in Arm in Arm...* have closed and editor Nobilis Reed has made his selections. Over 110,000 words of tentacle erotica to benefit Oceana with stories from a few of Coming Together's awesome regulars plus a baker's dozen new-to-us authors! Below is the line-up. (Bolded authors are new to Coming Together.) Release is planned for September 2012 in ebook & print-on-demand paperback. Longer stories may also be released as individual titles. * Coming Together is ever hopeful that this title does not meet with censure from various vendors and/or payment processors.